This Brinjal masala or gravy is a great side dish for coconut rice and vegetable pulao. 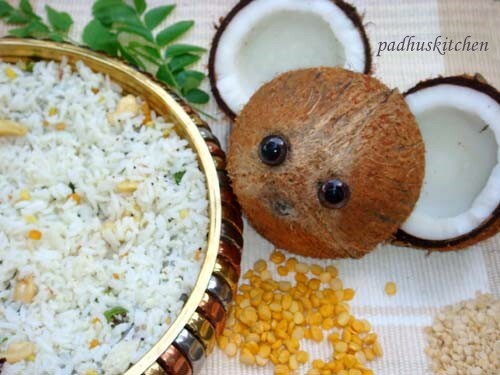 I came to know of this combo from my friend and from that day onwards, whenever I prepare coconut rice, I prepare this as a side dish. Try it and I am sure you are going to love this combo. Brinjal lovers like me will surely love this dish. Peel onion and garlic and cut it into half if it is too big. Cut brinjals lengthwise. Grind coconut, pepper and jeera to a fine paste and keep it aside. Heat oil, add mustard seeds, when it splutters, add fenugreek seeds, curry leaves, small onions and garlic. Saute nicely till onions turn pink. Then add chopped tomato and fry for a few more seconds. Add brinjal, turmeric powder, chilli powder, coriander powder, salt needed and cook covered on medium heat stirring in between until the brinjals are three fourth cooked. Add tamarind water and when it starts boiling, simmer and let it cook on low flames till it becomes slightly thick. By this time the brinjals will become tender. Then add the ground paste and cook for a further 2-3 minutes. Garnish with coriander leaves. This masala is a fantastic side dish for Coconut rice .You can try this brinjal masala for other mildly spiced pulao also which does not have tomato base. Note -Use less tamarind for this dish and not as you use for kulambu. You look like a 'Brinjal Recipe Queen' to me...so many dishes with Brinjal!! Yummy gravy n nice presentation!!! 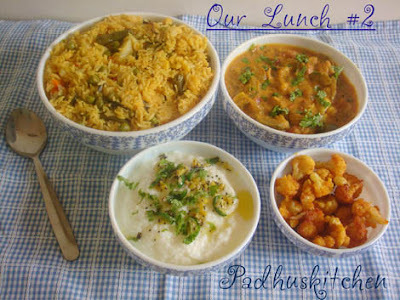 Your Lunch Menu Ideas and recipes are super.Thanks for sharing. that looks spicy & delish. i can never be sick of indian food :) you have great recipes on your blog ! Mouthwatering set of recipes. Looks so good. Lovely food. YUM! Very inviting Brinjal recipe Dear.Yum yum! 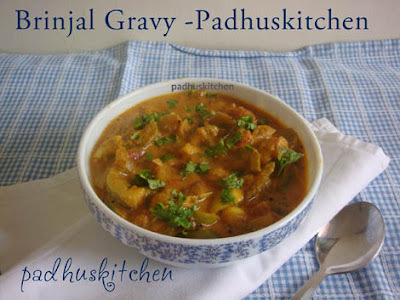 Hii padma i have tried this brinjal(potato) masala curry yesterday but i used potato instead of brinjal. Except that i followed your recipe as it is. It came out very good.My husband appreciated me sooo much.It was a great chance for me to prove myself.A lot of thanks to you..
this is my home pulikolambu. Very authentic blog for cooking. Prepared brinjal masal today. Drooling taste.